QuNexus is a very cool, very powerful instrument that is fun for beginners, but also very capable of meeting the demands of professionals. 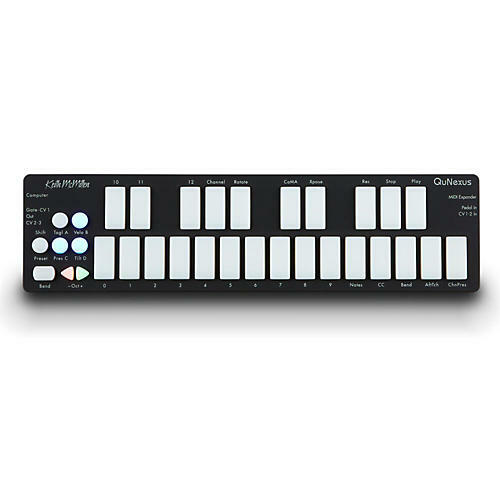 The QuNexus has 25 touch-sensitive keys that will detect finger pressure, velocity, and tilt, to give you an unprecedented degree of musical control. The vivid blue and white LEDs have 16 levels of brightness that will give you extremely valuable feedback while playing. Use the toggle/hold feature to help you build chords and create your own step sequencer or arpeggiator with LED feedback. QuNexus is your hub for new and vintage technology. Plug into your computer via USB, directly into your iPad with the Apple Camera Connector (not included) or Android tablet, control hardware via 5-PIN MIDI (MIDI expander required) or control your modular synthesizers with the included CV inputs and outputs.